I SWEAR I had this post all written up and ready to go on a note app on my phone weeks ago, but then I cut the text to paste it and deleted it by accident =( So here we go again! 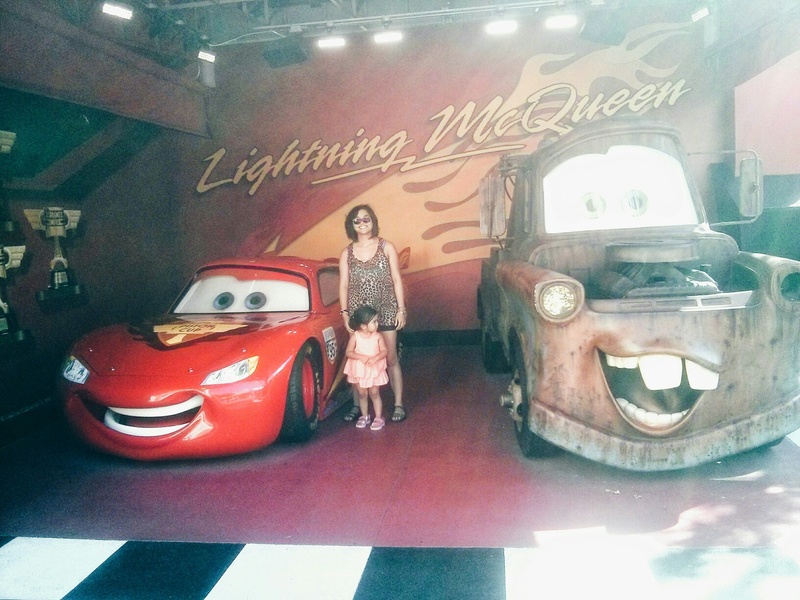 The 3rd and final Disney installment covers our trip to Hollywood Studios. The admission is the same as the other Disney parks: $99.00 for those age 10 and over, $93.99 for ages 3-9, and free < 3. We had purchased both Magic Kingdom and Hollywood Studios tickets online at the same time, so when we previously went to the Mickey Halloween party, they loaded both admissions conveniently on the same reusable card. The day was very hot, perhaps 32 degrees Celsius, and not rainy (at first). A little trick we do is to tell the ticket person that it’s our first visit every time and then you get a cute “1st Visit!” button to wear, so you can imagine how big our collection has grown =) Hey – at $99 admission, I feel entitled. As we entered the park, we were given Olaf cardboard fans to cool off. They were much needed. Our first stop was to the “For the First Time in Forever” Frozen sing-along show. We had to get an advance ticket and pick a show time, and then wait in line (about 30 minutes). The show consisted of a male and female host, with special appearances by Anna, Kristoff, and of course Elsa at the end. Basically, it was a gigantic screen that played the entire Frozen soundtrack, complete with lyrics, dazzling lights and special effects. It was about an hour and it was “so-so.” Nothing too exciting. It was cute hearing all those young voices singing word-for-word, though. 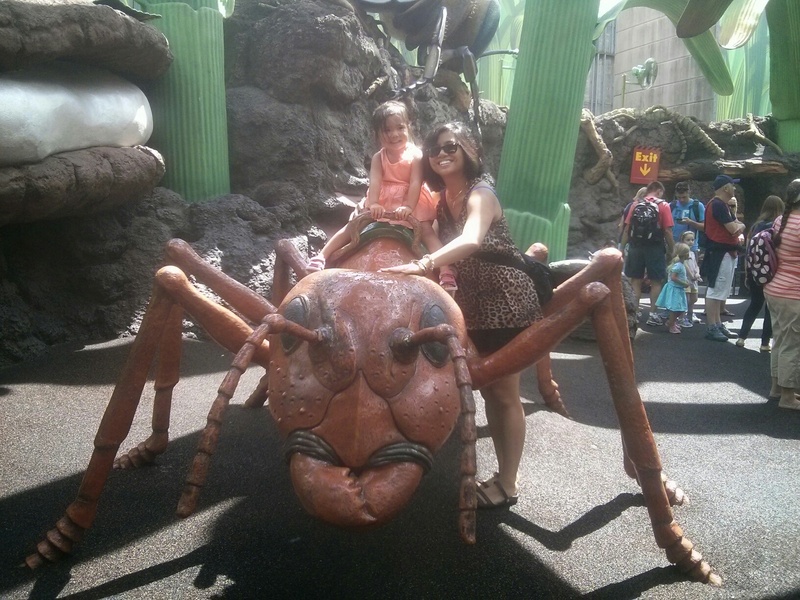 After that, we headed to the “Honey I Shrunk the Kids” playground. Overhead was a giant “spider web,” or jungle-gym type rope maze for kids (and parents) to climb through. There were slides and even a gigantic “Antie” just like in the movie. It was one of my favourites as a kid, so I definitely wanted to check this one out. I always dreamed of being a child actress and starring in such an adventurous film as this one. As the day was getting progressively hot and expectant mommy was starting to get hungry, we headed to the nearby food court to grab sandwiches, hot dogs, and ice cold soft drinks. 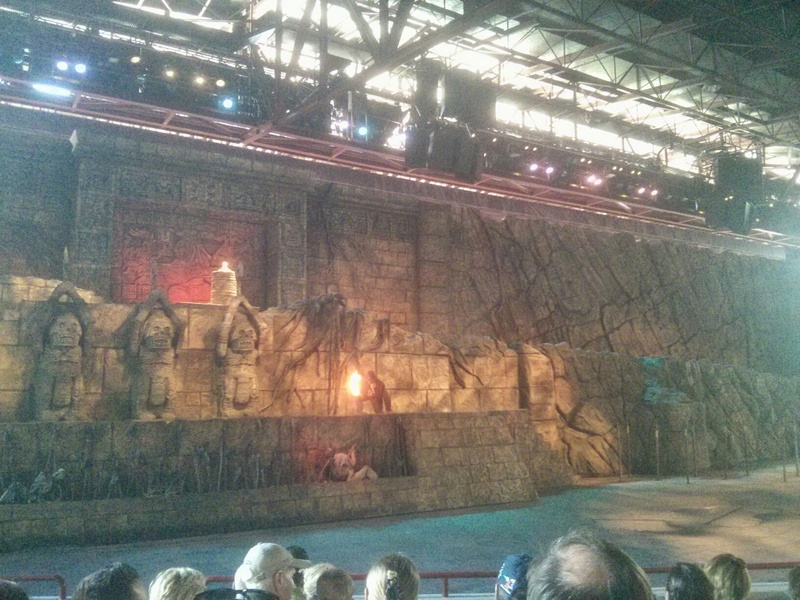 We spent the rest of the day on pregnant- and toddler- friendly rides and shows such as Muppet Vision in 3D, the Great Movie Ride, and the Indiana Jones Epic Stunt Spectacular (this was my favourite of the day – who didn’t love Indy in the 80s?!). We had wanted to take Dani to the Jedi Training Academy, where apparently kids get to do Jedi training with light sabers and all, but she was too young and/or short. I had always wanted to check out the Tower of Terror, so perhaps we’ll need to come back once the bun is out of the oven =) Also, there was a 2-hour wait for the Toy Story Midway Mania ride, so we said forget that. 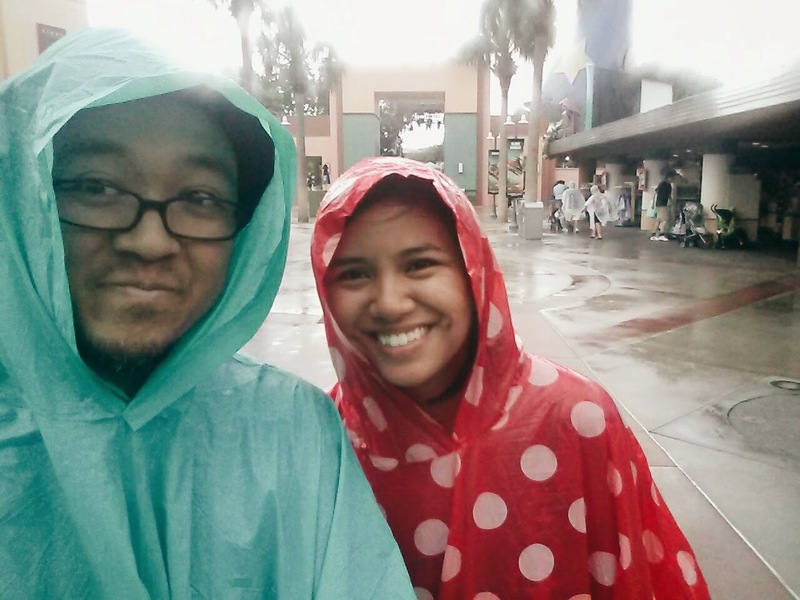 By that time, it had begun to rain (yes, we donned the Disney ponchos yet again), so we called it a day. All in all, I’d still prefer the excitement and crowd participation of Universal Studios, but maybe when Dani is at least 6 or 7, because DHS proved to be the more toddler-friendly option. 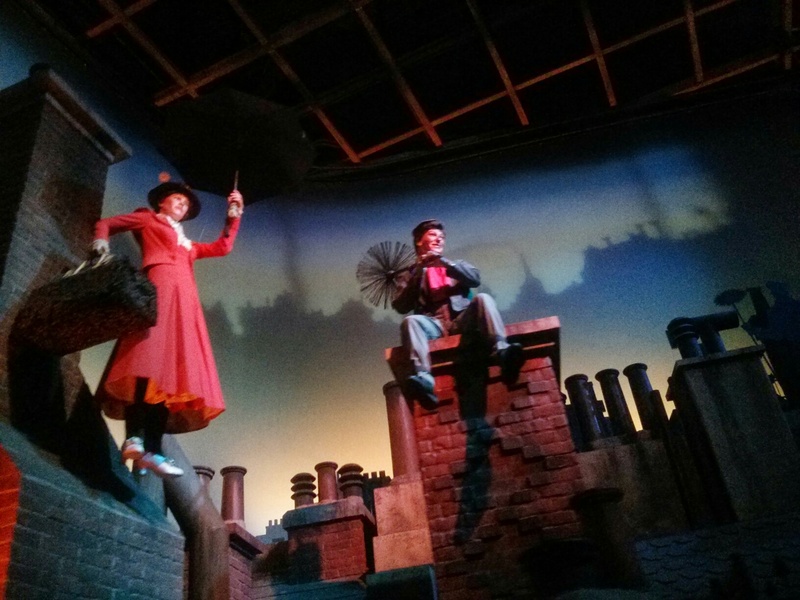 are there any big differences between disneyworld and disneyland? would you consider going to the west coast the next time you need a Mickey fix?